Deborah Kane of Edible Portland and Ecotrust interviewed Michael Pollan last month when he was in Oregon for a book-signing and speaking engagement. 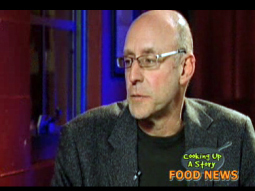 Conveniently, the interview and lecture were recorded on film by the talented folks at Cooking Up a Story. In these four videos, as we've seen in his books The Omnivore's Dilemma and In Defense of Food, Pollan unpacks and examines the political moments, economic realities, and marketing ploys that have lead Americans away from the simple joys of eating real foods to consuming myriad edible food-like substances. Be warned: Each segment is well worth watching, but runs 8 to 12 minutes long. If you want Pollan-in-a-hurry, we've got just the thing for you. h3. Part 1: "Eat food. Not too much. Mostly plants." h3. Part 2: Nutritionism and edible food-like substances. h3. Part 3: "There is wisdom in cuisine." h3. Part 4: "Voting with your fork is a very politically powerful thing to do."